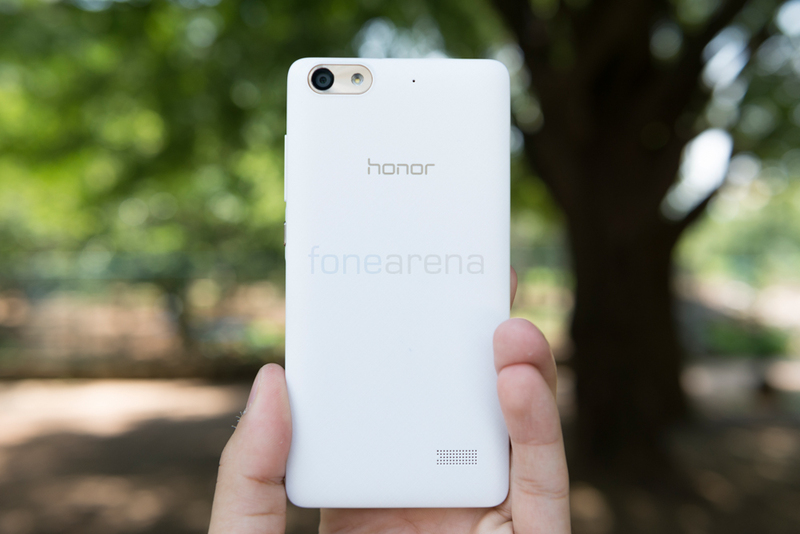 Huawei launched the Honor 4C along with the Honor Bee in India on 8th May. The 4C is the successor to the Honor 3C which was introduced in August last year. 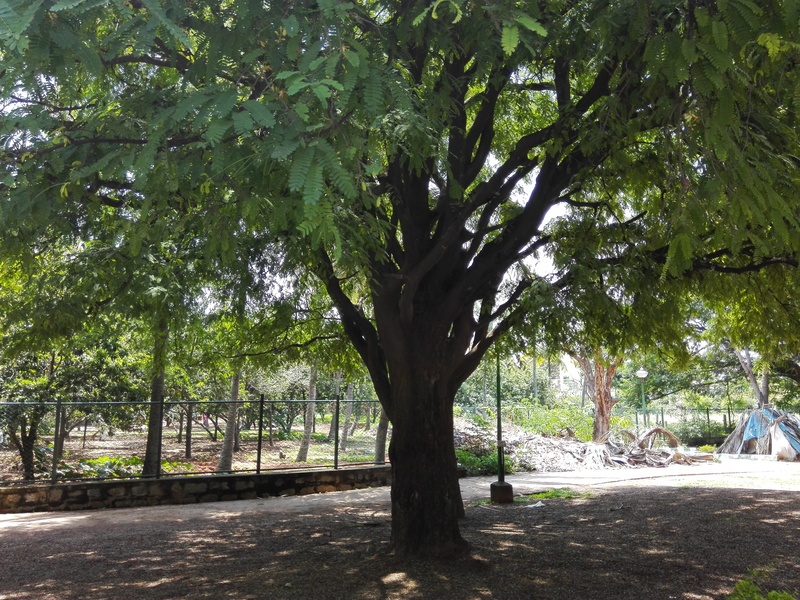 The device brings a lot of improvements compared to its predecessor in terms of specifications, especially in terms of performance and camera. 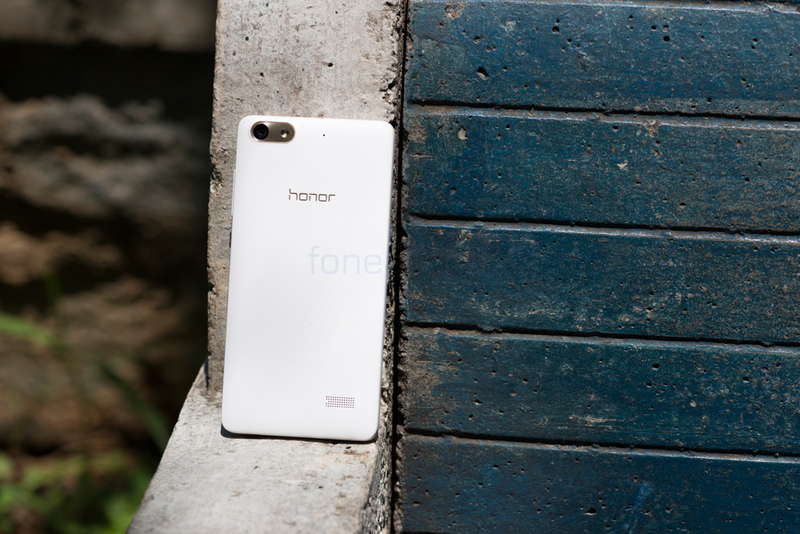 Let us see how the device fares in real life and whether it is a worthy successor to the Honor 3C and whether it is worth the money that you pay for it. The design of the 4C has changed quite a bit compared to the 3C. 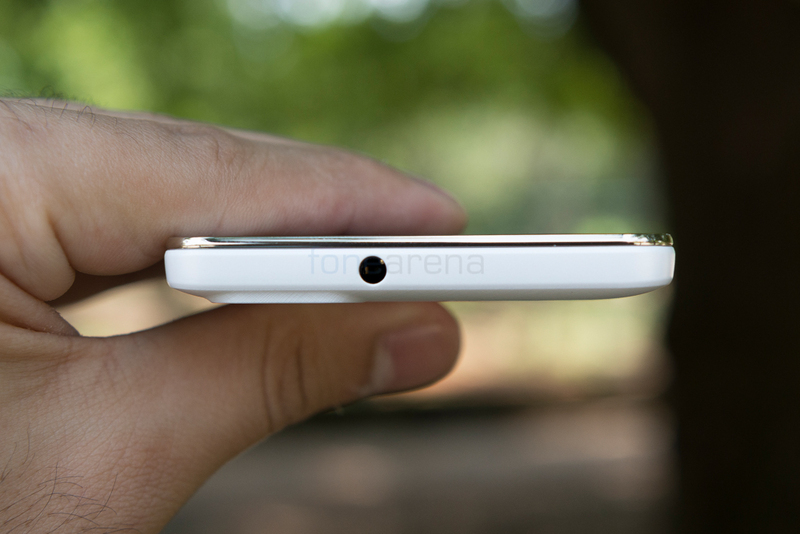 While the 3C had a rounded design, the 4C opts for flat sides with rounded corners. The physical size of the 4C is larger than the 3C that precedes it despite both the devices having the same sized screens. 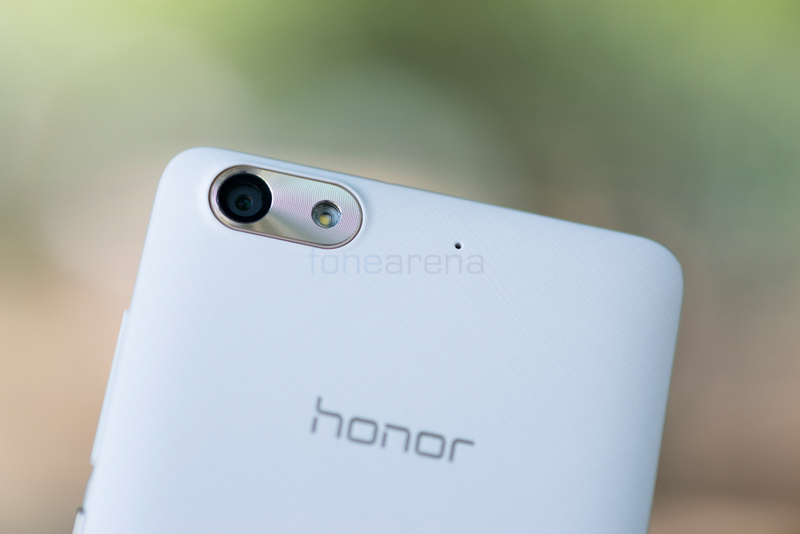 The Honor 4C measures 143.3 x 71.9 x 8.8 mm while the Honor 3C measures 139.5 x 71.4 x 9.2 mm. That means the 4C is a lot bigger in terms of length and breadth while the thickness is marginally lesser. The 4C is also heavier at 162 grams compared to the 140 grams of the 3C. Despite being bigger than the 3C, the 4C isn’t a tough phone to handle. The phone is still quite manageable and fits well in your hand thanks to the rounded edges on the four corners and the back. 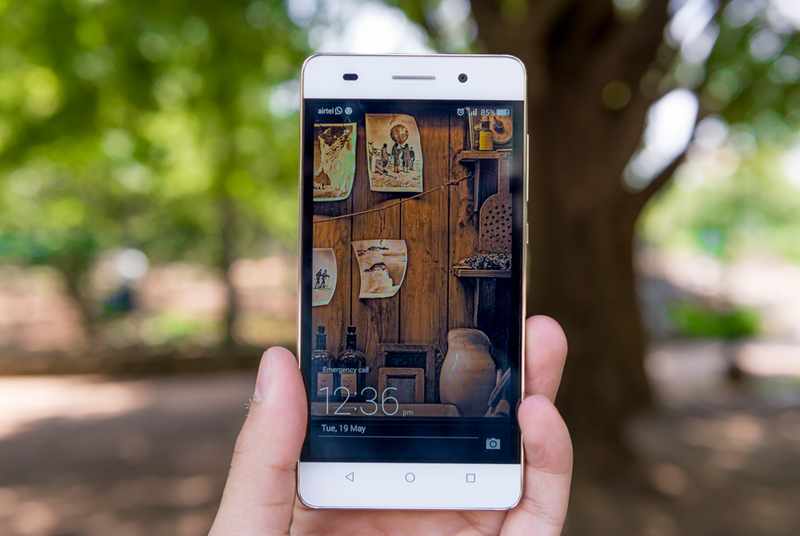 The phone is also easy to hold in both portrait and landscape mode due to the same reason. The extra weight of the phone isn’t actually a bad thing as it feels more premium than it’s 3C counterpart. The phone does feel quite solid and premium despite its pricing. There is a fake chrome bezel that runs all around the front of the device. It does have a chrome finish but has a slight gold tint to it. While it is most definitely made of plastic and feels the part, it is quite durable and gives the phone a nice look. 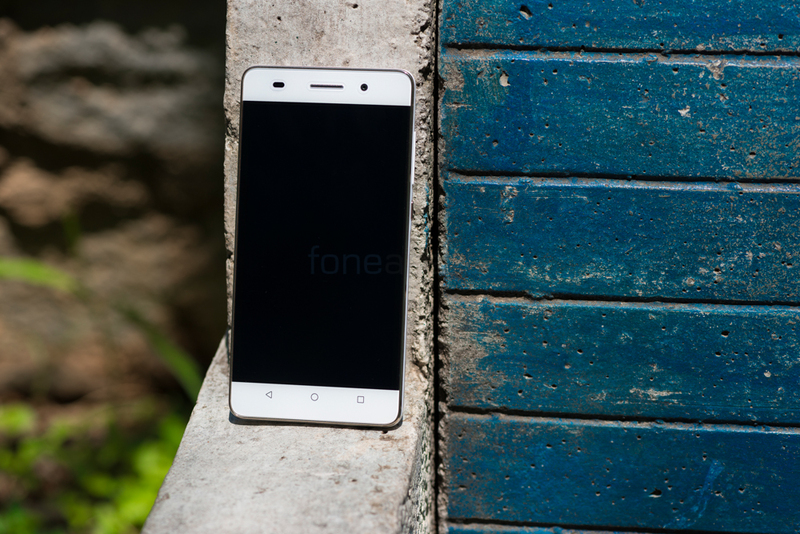 At the front you have the 5″ 720p display which we will discuss in detail later on in the review. Above the display you have the earpiece, the ambient light sensor, proximity sensor and the front facing camera. Below the display you have the three capacitive keys for return, home and options/multi-tasking. Short press on the right most key brings up the options and long press shows you the recent apps. We feel that Huawei could’ve opted to go for on-screen keys considering there is 5 inch worth of screen real estate and because most phones are headed in that direction nowadays. 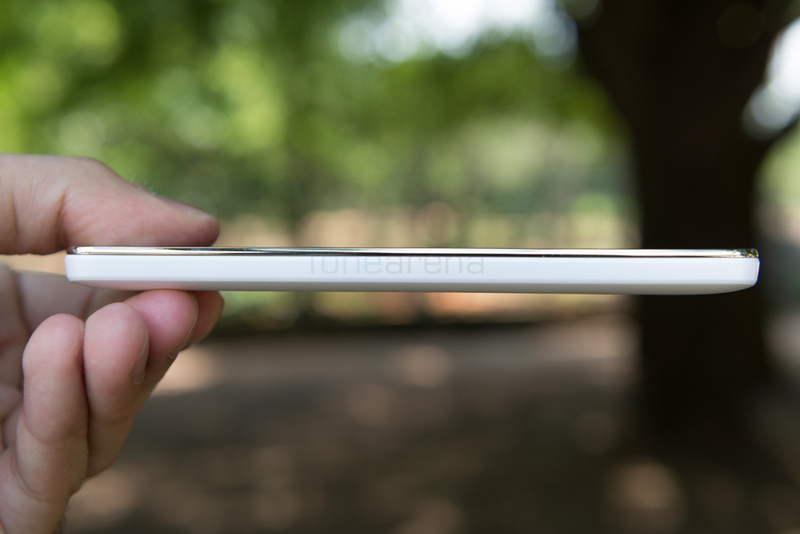 It also would have helped reduce the overall size of the phone especially in terms of height. 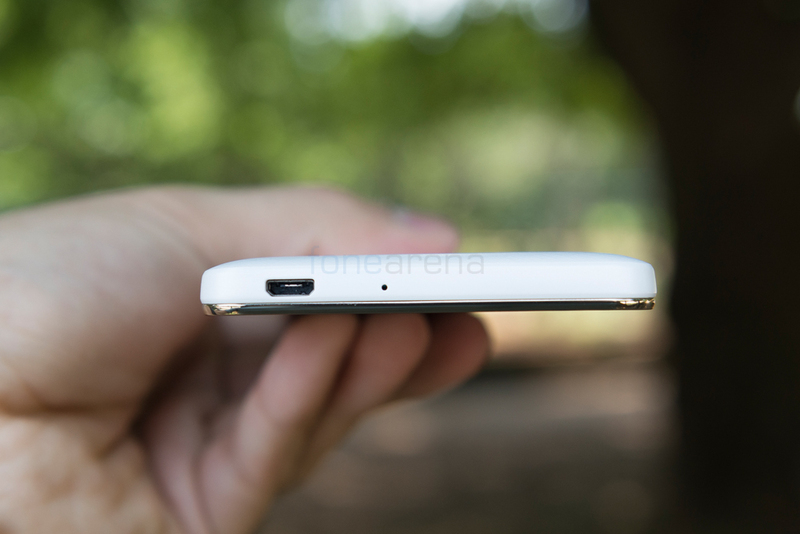 At the top, you have the 3.5mm audio jack and at the bottom, you have the microUSB port along with the primary microphone. The positioning of the microUSB port is actually quite annoying to those who use it in their car. If you have your phone on a cradle and wish to charge the phone, you will notice that the phone’s microUSB port is blocked by the cradle’s support. The workaround would be to place the device with its right side facing downwards and enabling auto rotate. Not the ideal solution and is an issue that could’ve been avoided with better placement of the port. The left side of the device is empty as there are no controls or ports here. On the right side, we have the volume up/down rocker as well as the power/lock key. The volume button comes in the same colour as the phone but the power key has a silverish golden paint effect. 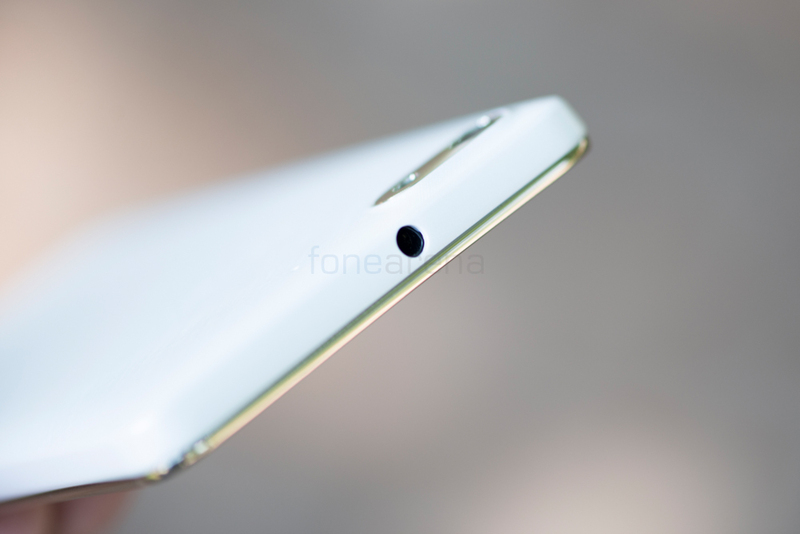 At the back, you have the 13 Megapixel camera at the top left along with the LED flash. It is flush with the body but has a thicker upper lip because of the way the body curves towards the edges. The camera unit and the LED flash are housed by an elliptical plate and next to it is the secondary microphone. There is the Honor branding in the middle and the loudspeaker at the bottom right. The texture of the back cover is quite nice to feel and look at and Huawei claim that they use actual Silk along with a combination of other materials to make it. You can see the woven pattern when you look at it closely. While it looks good, the back cover does make the phone quite slippery. We’ve had the phone slip from our hands while we were testing it and although luckily we never dropped it, it still isn’t something good in terms of handling. Perhaps slapping on a case would be a good idea if you are getting yourself one of these. The back cover is removable thankfully so if your device does get some wear and tear, you can easily replace the back panel. 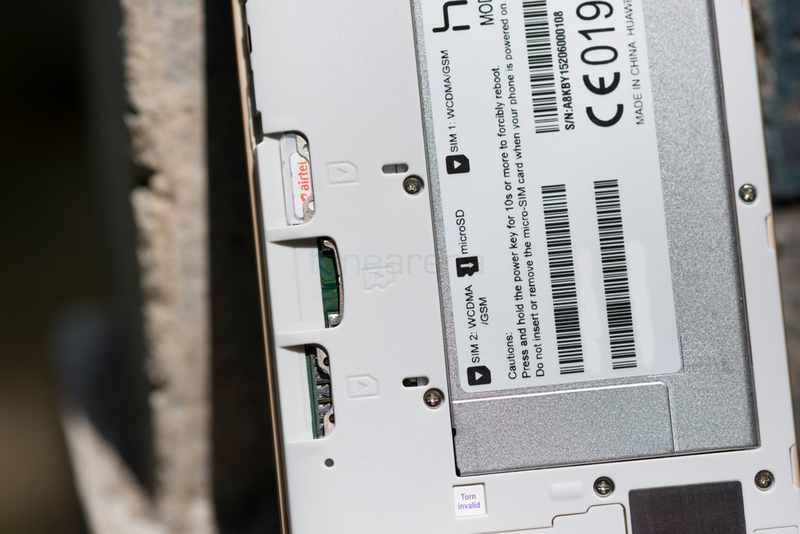 You also need to remove the back panel to access the microSIM card slots as well as the microSD card slot. The battery however is not accessible to the user and is non-removable. We quite liked the aqua colour finish on the black variant of the device while the white one has a grey colour with glossy finish. The phone is available in both black and white colour variants. There is also a difference in the inner colouring of the battery bay as mentioned above. The White colour variant gets a grey finish while the Black variant gets an aqua colour finish. We personally prefer the White colour over the Black one as it gives a more refined look. 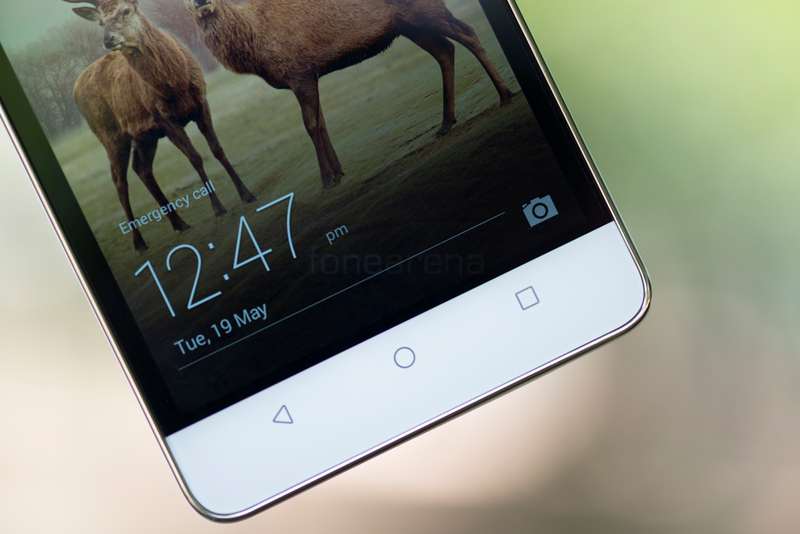 The display on the Honor 4C is the same as the one on the 3C. Both are IPS lCD panels with 720p resolution. The 4C is a larger device and has a lower screen-to-body ratio as compared to the 3C though despite both of them having the same screen size of 5 inches. 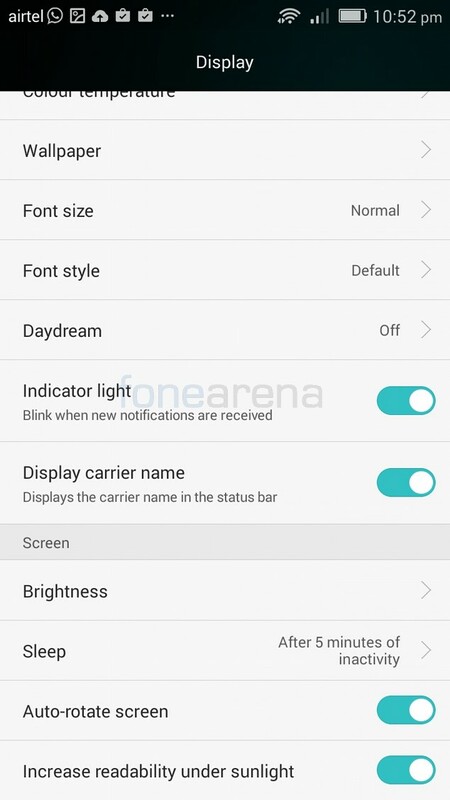 The 4C screen is designed in a way that it seems to be bigger than it actually is and seems to be bezel-less at the sides when the screen is turned off. However as soon as you turn on the screen, you realize that it is much smaller than it seems to be and that there are huge black borders surrounding the screen all around the display. This is true especially for the sides of the display. While we like the fact that it does seems to have a bigger screen, it is bad in some ways too. It looks good when not in use but when you start using the phone, the black bars are kind of annoying and do take some time to getting used to. The display hits the sweet spot in terms of size and the display quality is quite good. The colours are vivid and the display has more than sufficient brightness indoors. 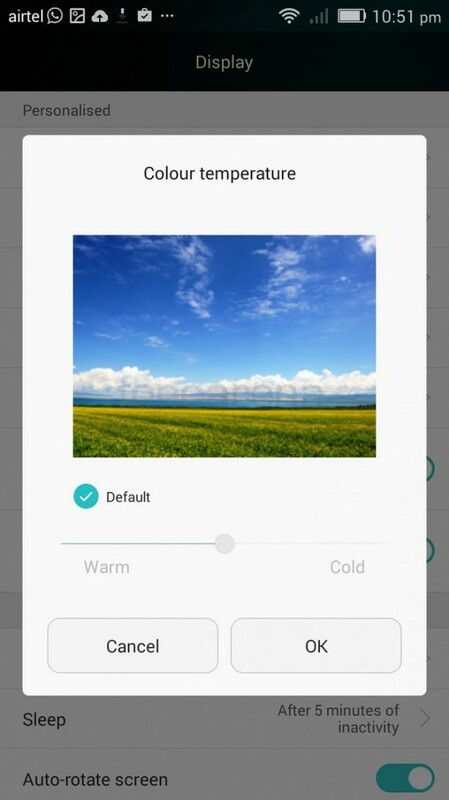 For those of you who find the colour to be inaccurate, Huawei give you the option of customising the colour temperature to your liking. You can make it warmer or cooler based on your preference. 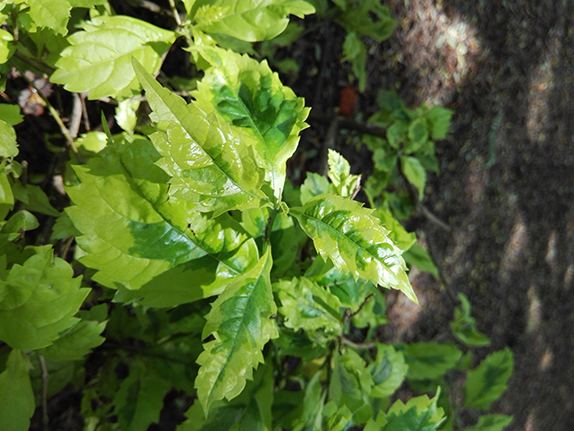 Outdoors, the device performs quite well despite having a reflective screen and the auto brightness works very well. Due to the reflective screen, some contrast is lost when viewed at an angle but it isn’t too bad that we’d complain about it. In fact, it is one of the nicer displays that we have seen on a device in this price range. The capacitive buttons aren’t backlit but that is sort of norm at this price range. The buttons however do have a reflective silver colour that kind of look appealing. One weird thing that we noticed on the phone was that it came with a screen protector built-in. We aren’t sure if all the units come this way or whether Huawei installed one before giving it for review but seems odd to have it pre-installed. Perhaps they are doing something similar to what Sony did for the first two generations of the XPERIA Z. But that was only because it didn’t have a nano coating on the display glass itself. In this case we aren’t sure why exactly it is on the device. While a screen protector is always good to have, we feel it should be left to the discretion of the user to decide whether or not to install it. We will check with Huawei regarding the same and update you regarding the same. The power/lock key is located on the right side of the device and we felt the positioning to be good. However if you place your phone on a surface then it becomes difficult to unlock the screen with one hand unless you hold it and then press the lock key. To overcome this, Huawei have included the double tap to wake feature which allow you to bring the device out of sleep mode by just tapping the screen twice. You can choose to enable it or disable it from the settings menu. The indicator light is quite bright and can be customized to blink when notifications are received or just glow when the phone has low battery or is charging. On the white unit, there is a bit of a light bleed as the colour of the light seeps through the white coloured plastic but in a way, it makes it more visible to the user. The black unit doesn’t have this issue. 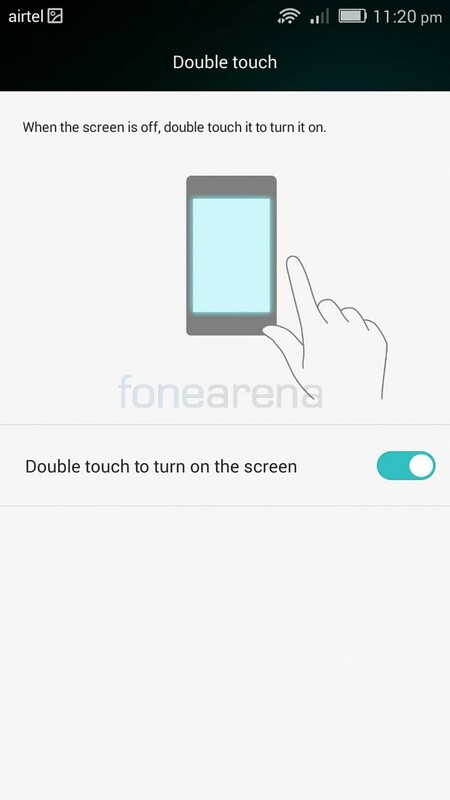 There is also a touch disable mode that prevents accidental pressing of the screen when it is in your pocket or bag. The dialer app is quite simple and easy to use. 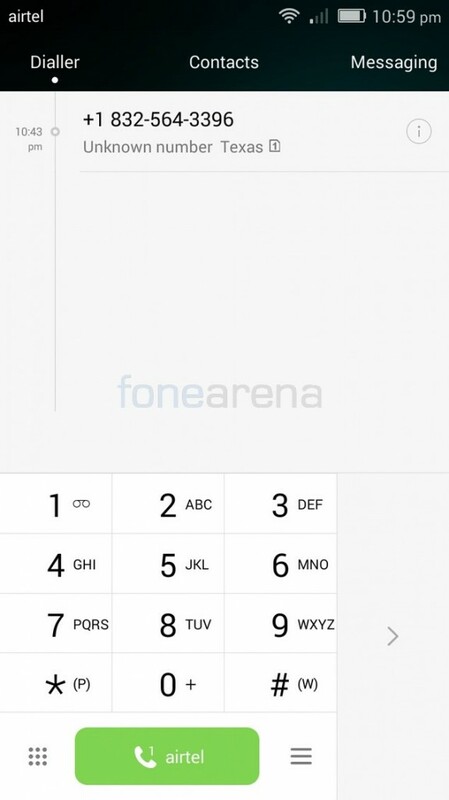 It gives you quick access to the dial pad, contacts and messages. 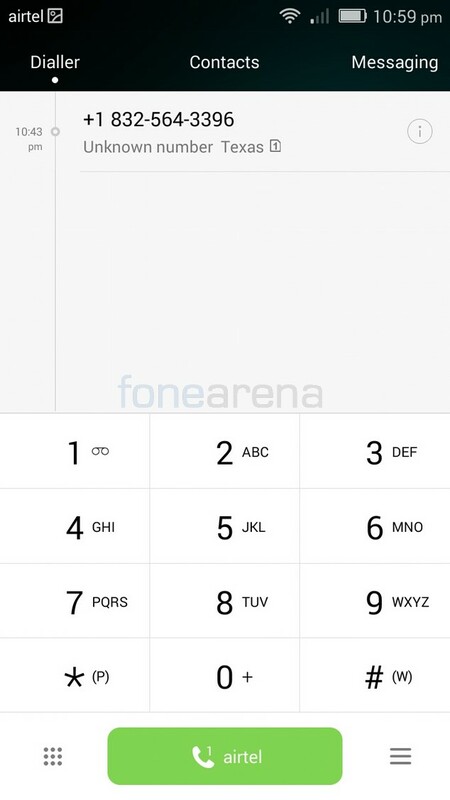 The dial pad is large enough to enter numbers on and you also get the recent calls that you’ve made, received or missed. 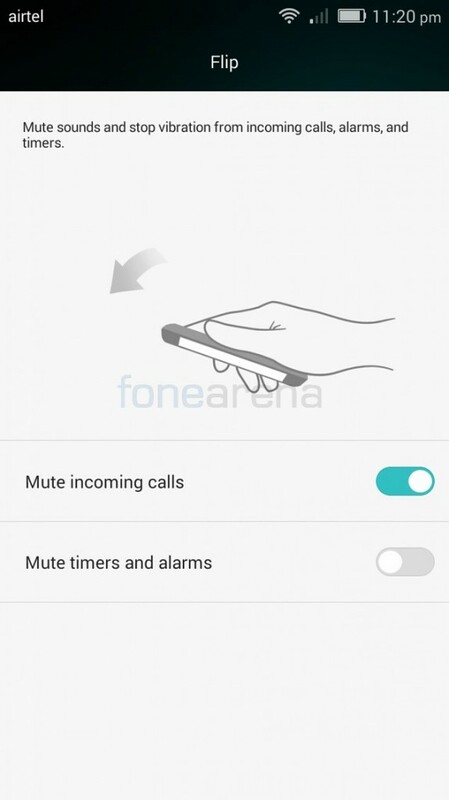 Despite being only a 5 inch device, Huawei have included a one hand UI mode where users can choose to make the dial pad smaller and move it to either the left or right side based on their preference. This is quite handy as even though some people can manage the size of the dial pad, they tend to use the phone with either their left or right hand. There’s a built-in Harassment filter that can be used to block unwanted messages or calls. Users can customize the rules the phone should follow in order to block it. If you wish to block only messages and calls from the numbers you’ve added to the blacklist then you can do that. You could also block a call or message that comes from a stranger or unknown number or all of the three. These calls and messages won’t appear in your regular call list or inbox but instead appear within the harassment filter sub category. The phone can notify you when such a call or message is intercepted or can remove notifications altogether. 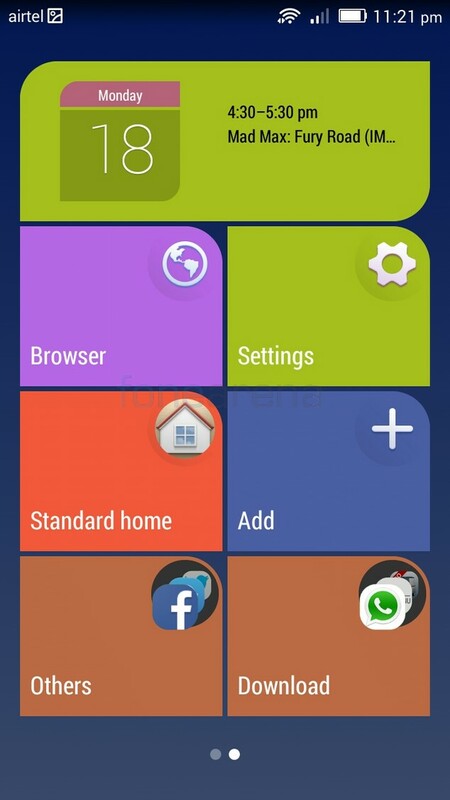 The contacts manager is just as good as any other Android device. You can have practically unlimited entries of people and their information such as phone numbers, emails, addresses, birthdays, websites etc along with a photo as well. You can choose to share it, import/export them and save them onto your SIM, phone or email id. Messaging is quite easy on the 5 inch screen as it is coupled with the Google keyboard. 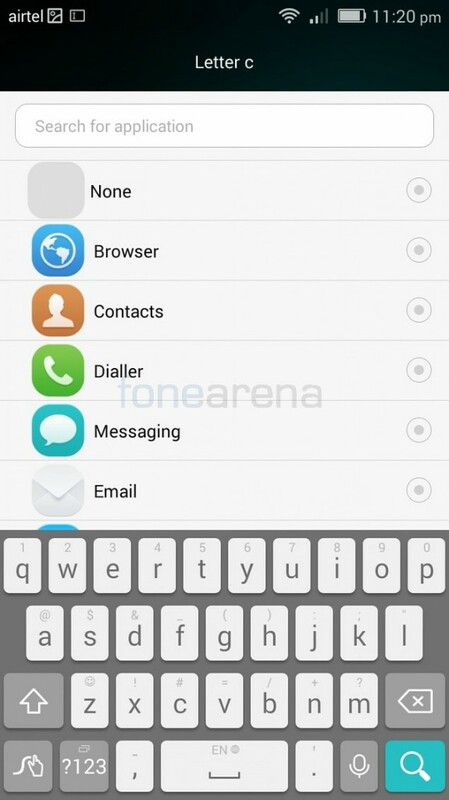 Odds are that you have been using the Google keyboard as well on your previous phone and shifting to this phone would still feel at home since the layout doesn’t change. If you aren’t happy with the built-in keyboard, you can of course go for a 3rd party one by downloading it from the Play Store. Call quality is quite good – the earpiece gives sufficient volume and is clearly audible even in noisy environments. The microphone also does a good job at relaying clear audio to the party at the other end thanks to the dedicated noise cancelling microphone. The phone supports dual MicroSIM cards but there’s no LTE support on either as both get only 3G support. This is quite disappointing as for the price at which the handset is selling, there are competitors available with 4G LTE support and some models available even at cheaper prices with 4G. 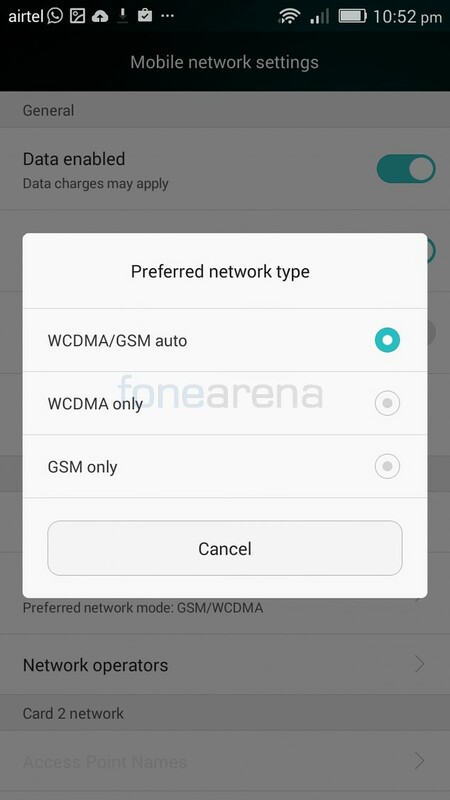 The phone has support for Wi-Fi a/b/g/n but no support for the latest ac standard and does not support 5GHz. It does have Bluetooth 4.0 and a microUSB port. 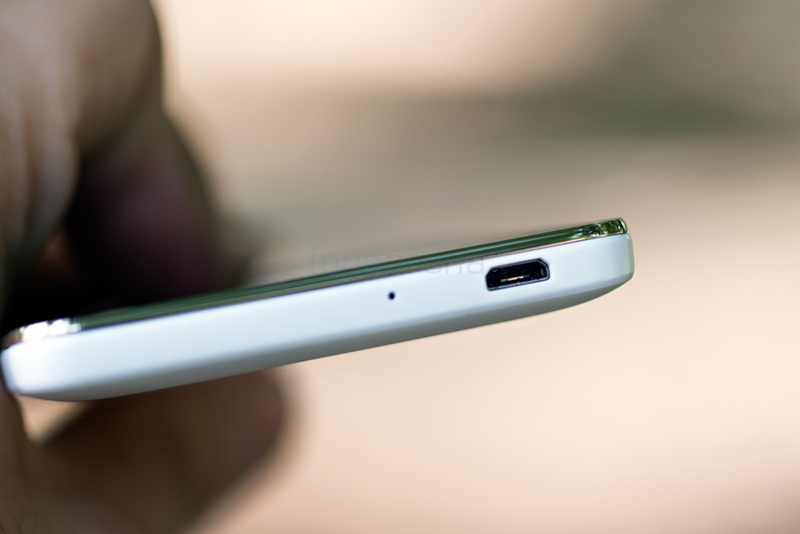 As we explained in the design section, we do wish the microUSB port was positioned more towards the center but aside from that no complaints here. 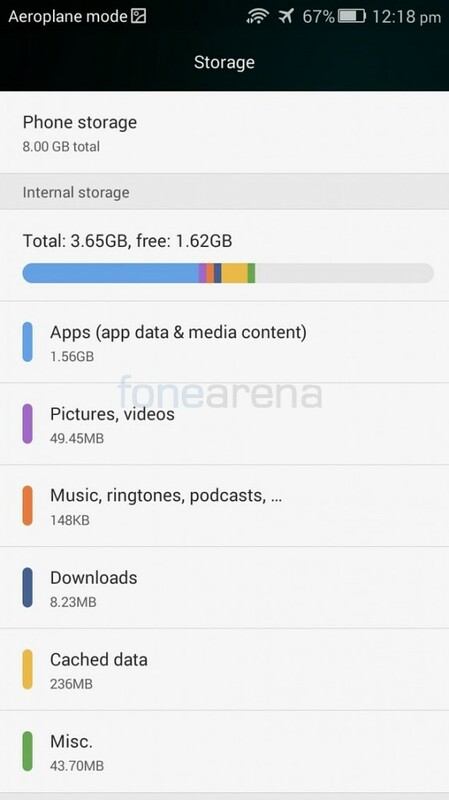 The phone has 8GB of built-in memory out of which the user gets just 3.65GB at their disposal which is not a lot. 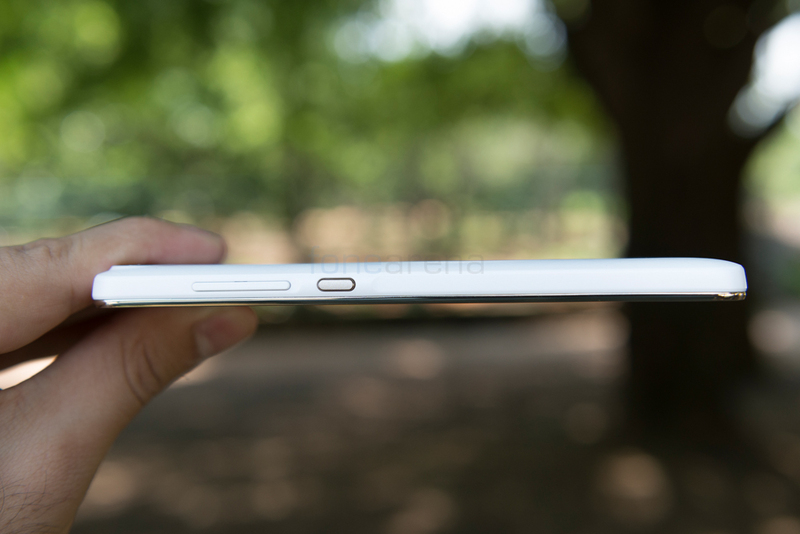 But one relief would be that there is a microSD card slot that has support for cards up to 32GB. Even then users cannot move their apps to the SD card. Perhaps support will come once the Lollipop update comes out. We tried OTG and the phone was able to handle even a 256GB flash drive easily. Despite most of the phones in its price range coming pre-loaded with Android Lollipop 5.0, the 4C still sticks to the ageing KitKat and that too 4.4.2. Huawei is promising an update to Lollipop 5.0 soon but would’ve been nice to have it out of the box and probably 5.1 would be the norm by the time Huawei get Android 5.0 onto the phone. 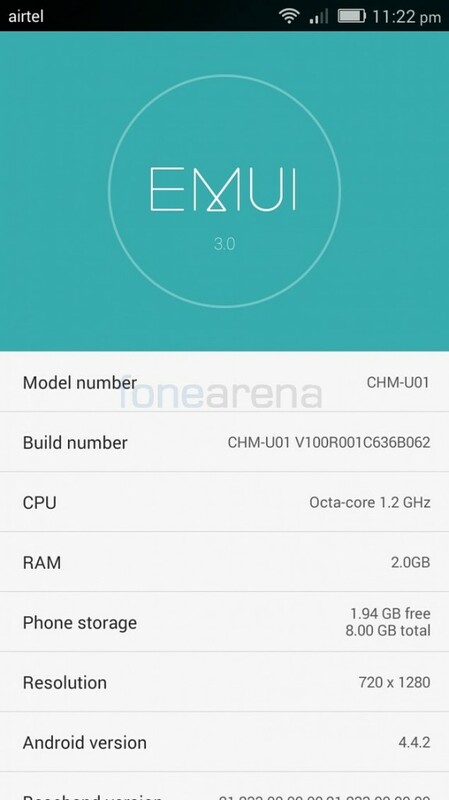 The consolation is that the phone does get an updated version of EMUI. Version 3.0 to be specific and it does bring visual changes and improvements in terms of speed as well. The UI is quite smooth and responsive. There aren’t any lags as such and the animations are soothing. The lack of an app drawer is something that some people might not like. I personally prefer to have an app drawer as well as I prefer to have clean and organized home screens. Yes you can organize and arrange the home screens to your but people who are used to app drawers might find themselves hunting for the app drawer button only to realize that it isn’t there. But that is something that you can solve by installing a 3rd party launcher. There is also a simple home view that looks like the Windows Phone UI if you prefer to make things more simpler. The lock-screen changes the wallpaper each time you put the device to sleep and wake it up. It offers the time, day and date as well as a camera shortcut. If you pull up from the bottom of the lock-screen, you get options to control you music including pause, next, save, share and settings. You also get shortcuts to voice recorder, calculator and toggle for the flashlight. All of which can be accessed without unlocking the screen. Pulling down from the top gives you access to the quick settings as well as notifications. You can even choose to allow or deny apps from showing their notifications. As mentioned before, the phone does support double tap to wake. 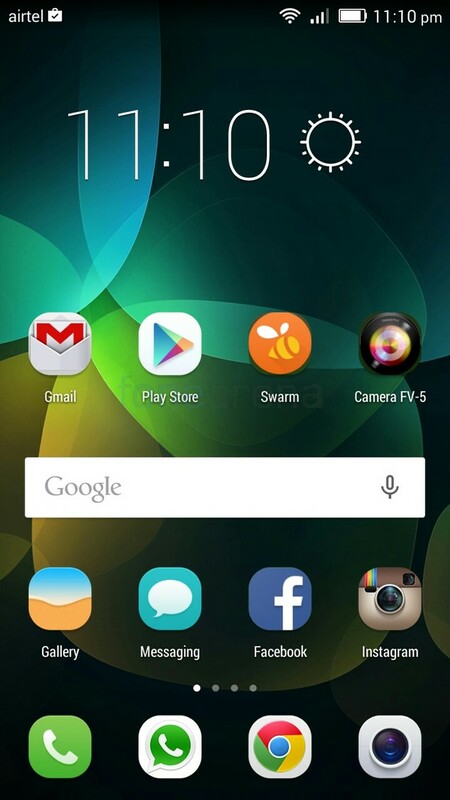 You also have gestures that you can draw onto the screen in order to launch a particular app. These gestures work even without having to wake the device up from sleep. You have 4 preset letters to choose from – C, E, M and W. While you can assign a different application to each of these letters, the letters themselves cannot be changed and you have to make do with the 4 presets. Flip to mute (Calls and Alarms) and shake to rearrange icons are also two motion based actions that the phone can do. Although we don’t see a particular use for the latter especially considering it’ll be tough to find the already cluttered apps on the home-screen. 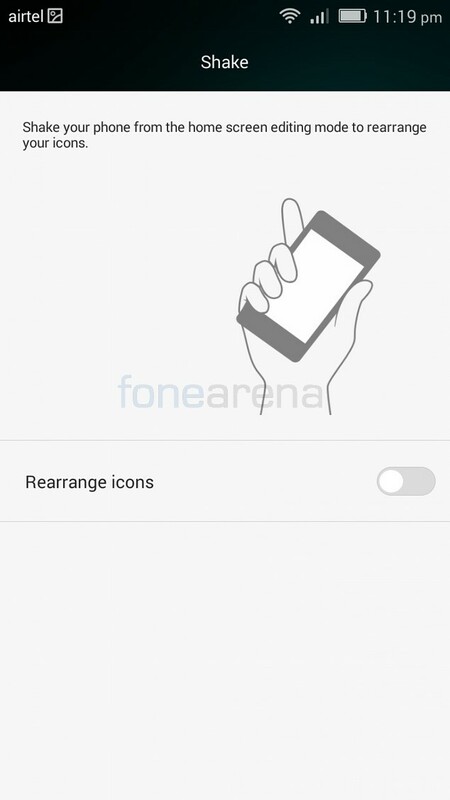 You can also enable the suspend button which basically enables on-screen versions of your capacitive buttons along with one touch optimization and screen lock. The 4C drops the Meditek chipset used by the 3C and instead opts for an in-house Kirin 620 octa-core processor clocked in at 1.2 GHz. 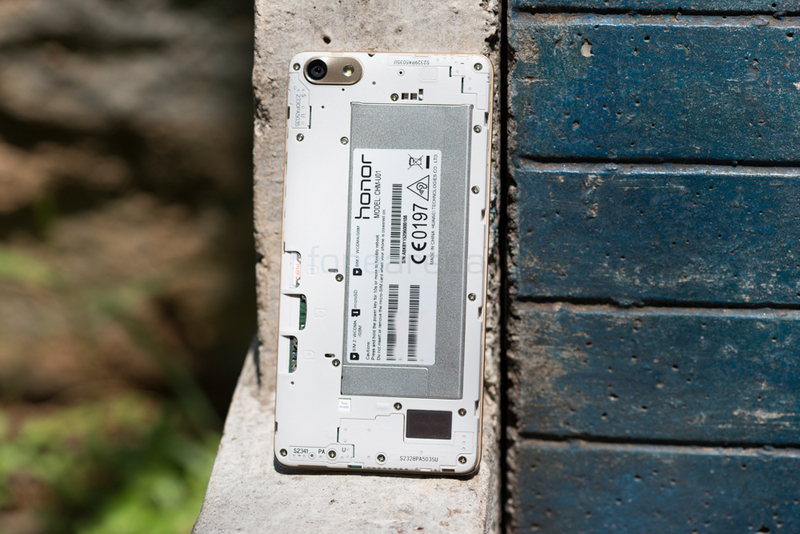 It also has 2GB of RAM at its disposal out of which around 1.24GB of memory is available. We didn’t have any issues with the performance of the device even when multi-tasking. The device performed well without any lag or hiccups. 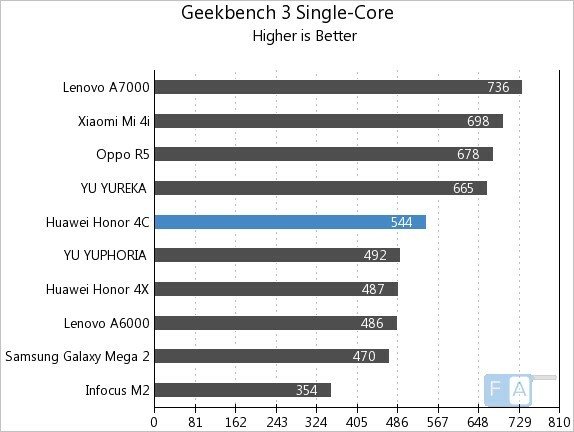 Here are the GeekBench 3 and Nenamark 2 scores of the 4C. 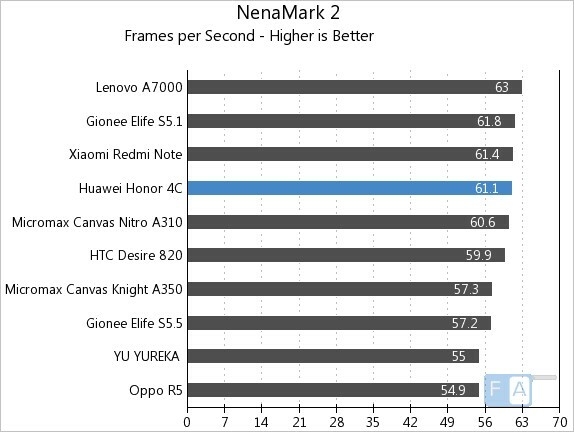 If you wish to check out all the benchmarks, you can do so by following this link. 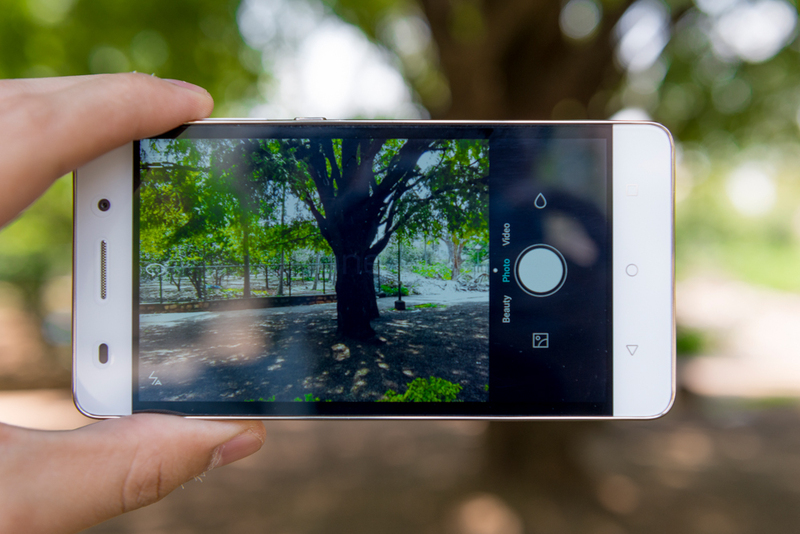 The Honor 4C is equipped with a 13 Megapixel camera with an LED flash. The camera performs quite well in daylight conditions. We found the white balancing to be quite accurate and the colours are quite natural too. 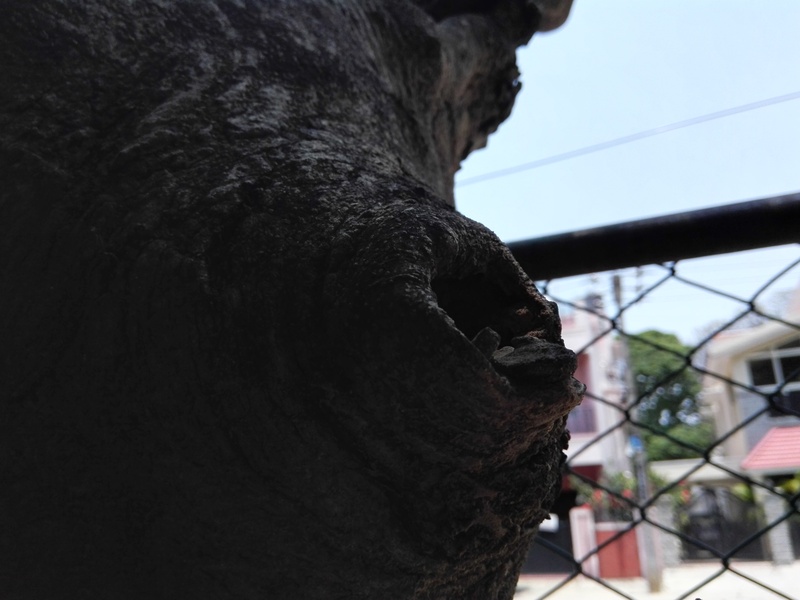 The camera manages to capture quite good detailing and is capable of taking good quality closeups as well. The quality of the night shots aren’t too bad either but there is a bit of noise creeping in. The LED flash is quite under-powered and the image that are captured using it seems quite ‘un-natural’. We’d recommend taking photos without the flash and rather use the flash as a torch unless necessary. The phone can record videos up-to 1080p resolution at 30 fps. The quality of videos is decent but the detailing isn’t very good. The colour accuracy is also not as good as the camera is able to capture in images. The front facing 5 megapixel camera is decent but does face some issues with shutter lag so you have to make sure that you are quite still when taking selfies. The output is good even though the images do seem a bit soft. We wish that the sharpness had been a bit better but that’s probably something they can fix with a firmware update. 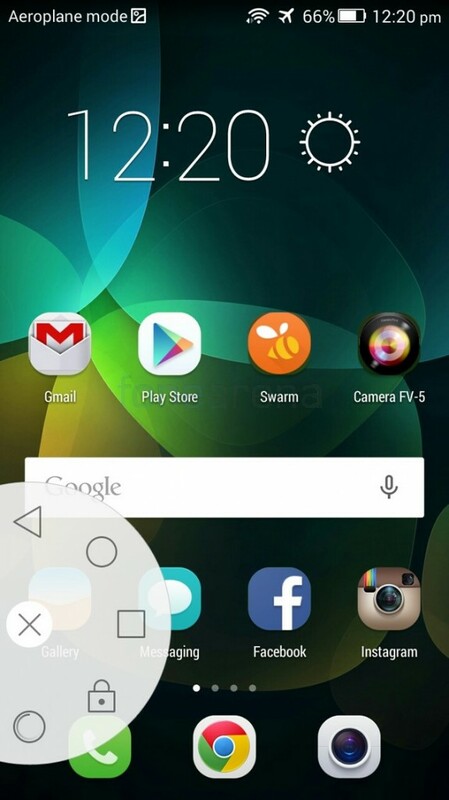 The camera interface is quite simple and it rotates based on the phone’s orientation. When held in landscape mode, you have the shutter button on the right along with the filter menu on top and the gallery shortcut below it. 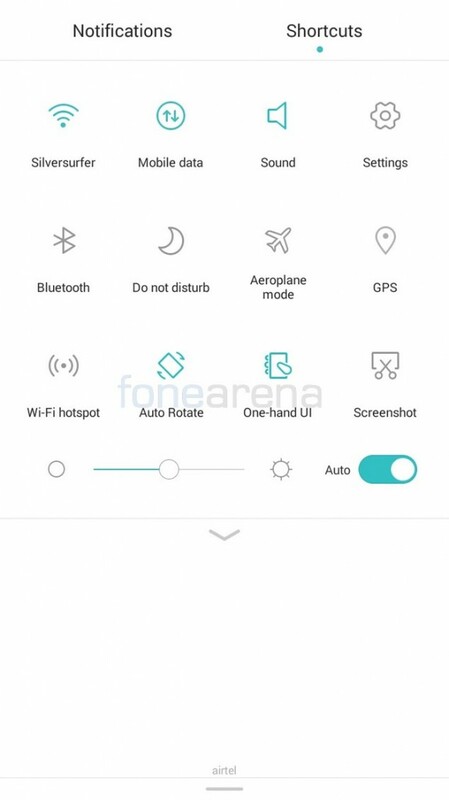 On the left you have the shortcut for the flash settings, the camera switch and the mode menu.You have 3 basic options to choose from – Photo, Video and Beauty. Beauty mode is just like photo mode but allows you to enhance skin tone and details to make it look smoother. Within the settings you can adjust the ISO, White Balance, saturation, contrast and brightness as well. 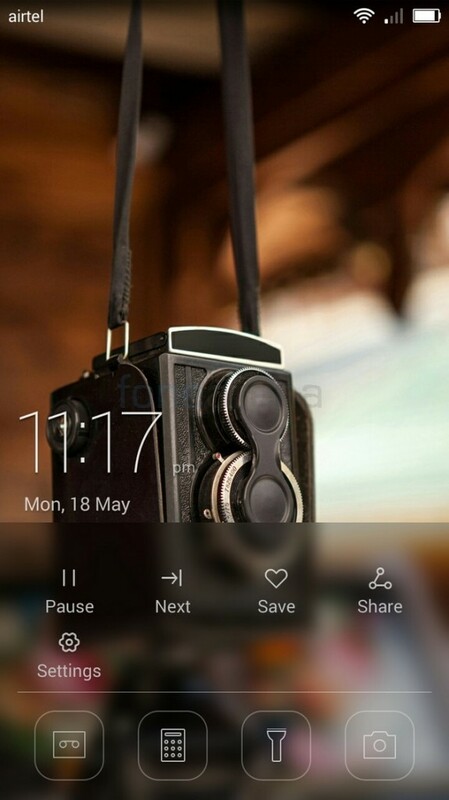 In the modes, you can choose between panorama, HDR, audio note, best photo, all focus and watermark. All focus allows the user to change the point of focus after the image has been captured. The rest is self-explanatory. The camera focuses on the object that you put the tracker on and will also do the exposure according to the point of focus. 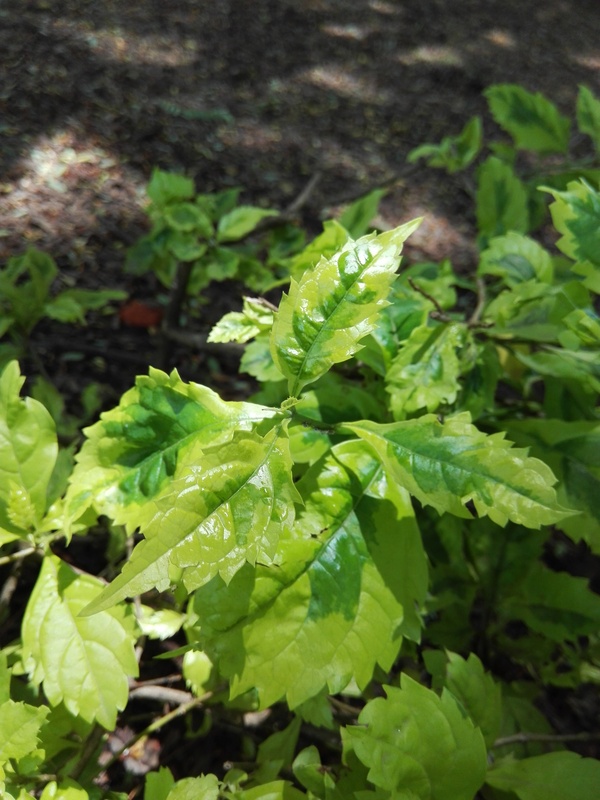 The phone can shoot at a maximum resolution of 13 Megapixels in 4:3 aspect ratio. 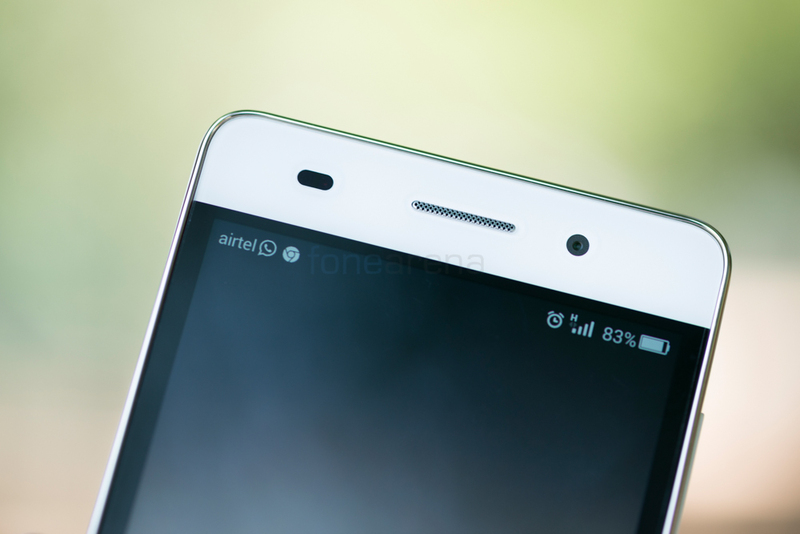 16:9 aspect ratio is supported as well at a maximum resolution of 10 Megapixels. Users also have a 1:1 option if you are someone who uses Instagram a lot, this option should be quite helpful to you as it will save you the hassle of having to crop the image later. It also has a maximum resolution of 10 Megapixel. Geotagging is supported and users can choose whether to save photos onto the phone memory or SD card. You can program the phone to take a photo based on voice commands as well. For example if you say “Cheese”, it will take the photo and it works pretty well even in noisy environments. The camera can also take photos automatically when it detects smiles and also use object tracking to focus on an object and capture it in focus later on even if it is moving. The Music player is quite basic. 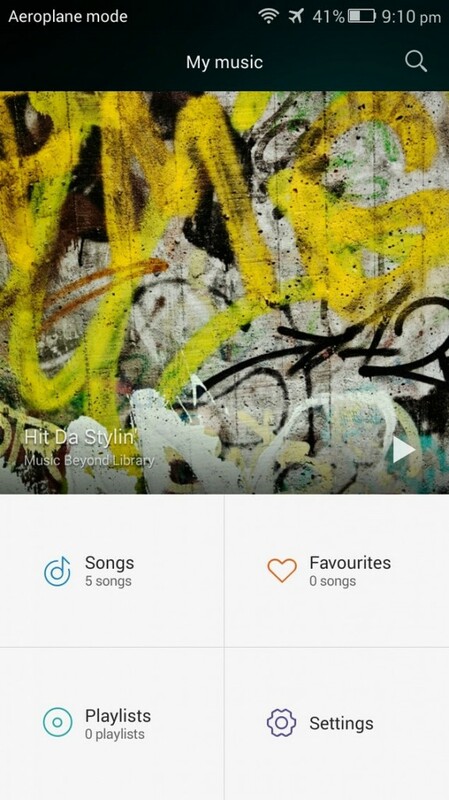 It offers you the list of Songs, Favourites and Playlists. The songs can be grouped in the form of titles, artists, albums or folders. The now playing screen has the regular Previous, Play/Pause and Next buttons. You can see the time elapsed and time remaining and use the progress bar to seek through the songs. The DTS icon is present on the top left corner. Enabling it will light up the logo in a bluish-green color. 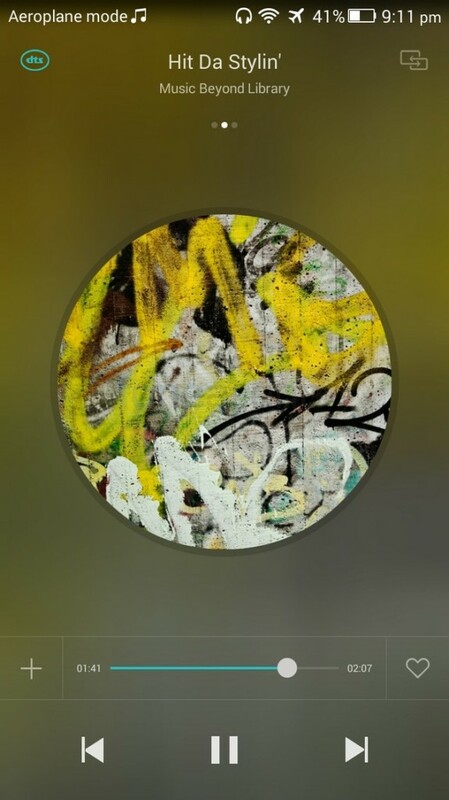 Users can choose to view the songs, album art or lyrics (not all tracks are supported).The music player also offers a timer setting where it stops playing after a certain amount of time as well as a length filter which will only show tracks that are less than the specified time limit. The phone also has support for FM Radio and it performs really well. It offers good quality without any distortions. You will need to plugin a headphone or earphone as it uses that as an antenna. Surprisingly, the volume using FM radio is much more than using the music player. FM Radio doesn’t work in flight mode but works even without a SIM card as long as flight mode isn’t enabled. The quality through headphones is good. The only issue we found was lack of sufficient volume. In most instances you wont have to use the phone at max volume. But in case you are in a noisy environment and the earphone or headphone you are using isn’t good at isolating the outside sound then you might find it to be a bit soft. There is also a DTS mode which does seem louder and also gives a nice surround effect. It does artificially enhance the bass though and some people may or may not like it. There are no earphones/headphones bundled in the box itself so you will have to use one of your own. Thanks to the 3.5mm audio jack, you can at least be sure that almost every headphone will work with the device. Coupled with a decent pair of earphones, you can get a good experience out of the device. 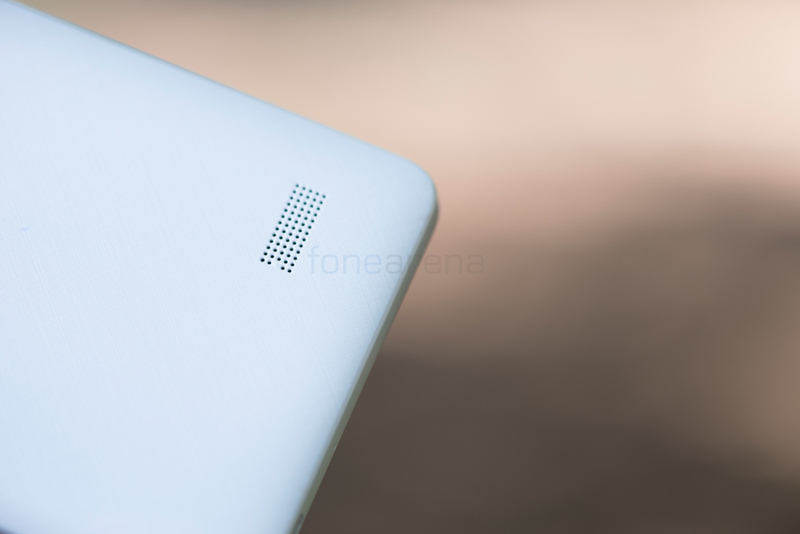 The loudspeaker of the Honor 4C is located at the bottom right at the back. The quality is quite good and so is the loudness however if you place the device on a flat surface, the loudspeaker does get muffled and the volume also drops quite a bit. 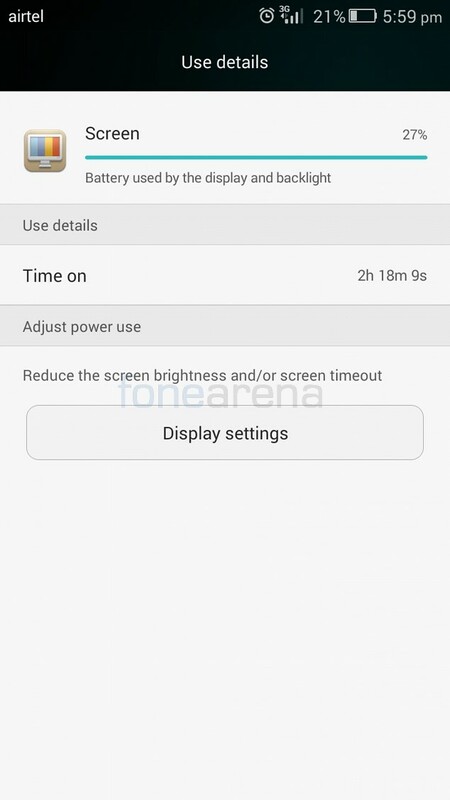 In the time that we reviewed the handset, we found the battery to be one of the major issues with the Honor 4C. The battery life is average at best and will definitely die down on heavy users around half way through their day. Light users could manage with the device and medium users could maybe pull off a day of use on certain days if they’re lucky. Here are some usage stats that we got upon use. We will be conducting our full-fledged battery tests soon and update the review with the results as soon as it is finished. 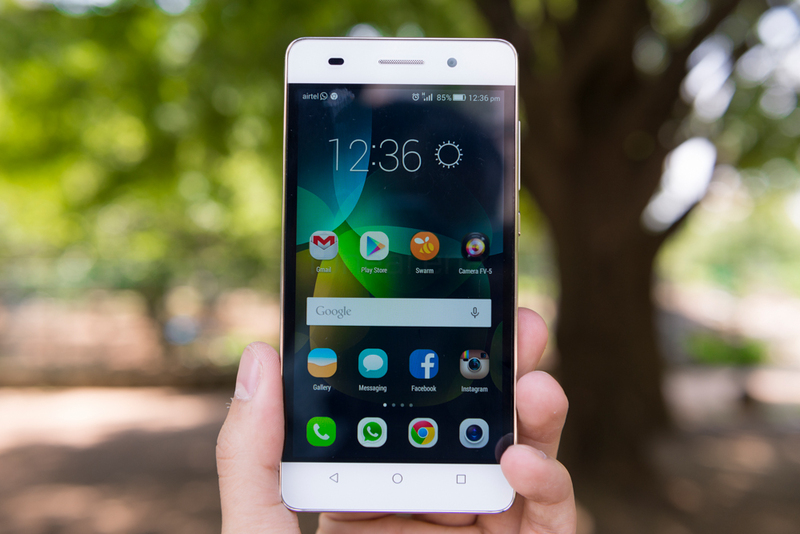 Overall the Honor 4C is quite a capable smartphone. The display is quite nice, the camera is of good quality and the music quality is also good. 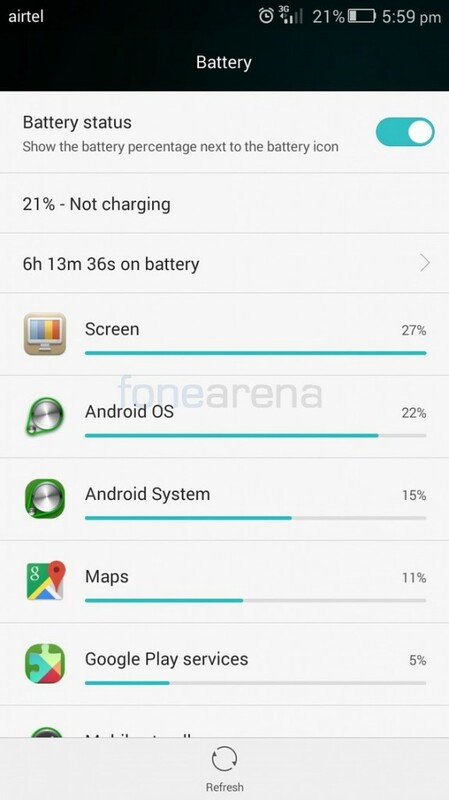 Where it falls short is the lack of 4G support as well as the average battery life. Then there is the pricing – there are quite a few devices out there that offer 4G support at the same price and their battery life is better as well. While they may not have as good a camera or display, they are still quite good and offer a better deal at the same price. We would suggest that if you are going for the Honor 4C, do so if you are fine with its disadvantages and if it offers everything you need.